A roster of luminaries from the federal government of the 1990s on Tuesday released a long-term spending-cut and tax reform plan designed to tackle the nation’s debt crisis while reducing after-tax income inequality. The spending side of the plan includes counting the $1.5 trillion in reductions enacted in the past year, some new defense cuts, adjustments in Medicare to “bend the cost curve” without hitting beneficiaries, and other proposals the center offered previously. Among those are cuts to federal retirement benefits, which, as noted by John Podesta, the center’s founder and chair who was President Clinton’s chief of staff, are part of the current talks between the White House and Congress on avoiding the fiscal cliff. The report did not go into much detail on these reductions. The $4.1 trillion plan would bring the nation’s debt-to-gross domestic product ratio below 72 percent by 2022, according to center president Neera Tanden. It would do so in part by restoring the top marginal tax rate to its Clinton administration rate of 39.6 percent, raising the capital gains rate to 28 percent, making deductions more uniform in their benefits to different income groups, and simplifying tax filing so that most taxpayers would fall in the 15 percent bracket and would not need to itemize. The plan, a consensus of former White House and Treasury and Commerce department executives, would rely on such Democratic perennials as raising current taxes on cigarettes, alcohol and gambling; raising tax rates on so-called carried interest; and phasing in a cap on the mortgage interest deduction, among other proposals. 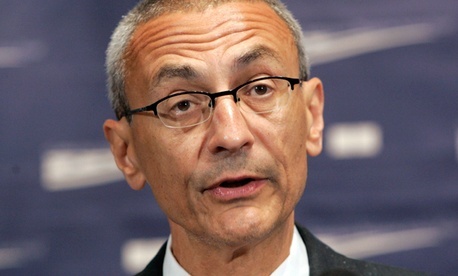 “Let’s avoid the fiscal cliff,” Podesta said in a Tuesday conference call. The negotiators “are likely to resolve it with some increase in revenues now, with instructions to Congress to complete a more comprehensive tax plan in 2013.” The CAP proposal, he said, “frames the parameters as a starting point for discussion” in the Senate Finance and House Ways and Means committees. Former Deputy Treasury Secretary Roger Altman, now executive chairman of Evercore Partners, said the plan “achieves a big chunk of deficit reduction, which the U.S. as a nation can’t afford not to do now.” He noted that left unchecked, the nation’s debt would reach 90 percent of GDP, or near the “dangerous levels” seen in European countries.